Record. Auto Transcript. Edit. Summarize. Share! All participants have the M>DApp on their smartphone and are wearing a headset. In a fixed set-up – courtroom, conference room – the App is on a tablet for every microphone. At the end of the meeting all individual recordings are transferred to the M>DWebportal. On opening an account you’ll find the recently recorded meetings. The system gives an estimate of the costs involved and shows your balance. Payment can be centralized for organizations frequently using M>D. When you agree with the costs , Autotranscribe is started and may take some time to complete. When the Auto Transcript is finished you may open the Edit Transcript screen. It has three parts: The Auto Transcript, The Auto Transcript to be Edited and a Soundwave bar. All three elements are synchronized. When you scroll, the two others will follow. While editing the Auto Transcript you can hear the original recording(s): mix or per participant. You can mail the Edited transcript, or when you don’t need a 100% correct transcript, you can mail the Auto Transcript. Some meetings are a pressure cooker: In one weekend the merger needs to be concluded. A default situation should come to a possible exit. There is lot at stake. The process should be efficient and transparent. Proceedings should be available in just half an hour after a meeting. And they should be accurate in every detail. M>D (Meeting to Docs) will produces a recording of every individual participating in a meeting. The individual recordings will produce the best automatic transcript possible. On the M>D webportal you'll find the AutoTranscript which you may want to edit. Recordings can be made using the app on the smartphone of the participants. If you need a temporary or fixed setup, please call us for setting up the technology. We can arrange a special – extra secure – environment, where the recordings and documents of your meeting will be as safe as in the Bank of England, but that is before Brexit! If needed, we will provide secretarial staff, with legal experience and managerial skills to smoothen the back-office process during hectic times. “We have the recording of every individual…never a hassle again about who said what ...all processed into a precise transcript…automatically for the most part. From the exact transcript we take it to the minutes of the meeting: copy-paste, a little editing and…. Done." The meeting room of the City Council, the Parliament, or County Assembly is equipped with a conference system. We want to record the audio of every participant individually. We therefore split the signal of every microphone to feed it into a tablet. From there on, M>D processes the individual audio channels from sound bytes to text bytes and assembles it to the AutoTranscript. This is never 100 percent accurate. 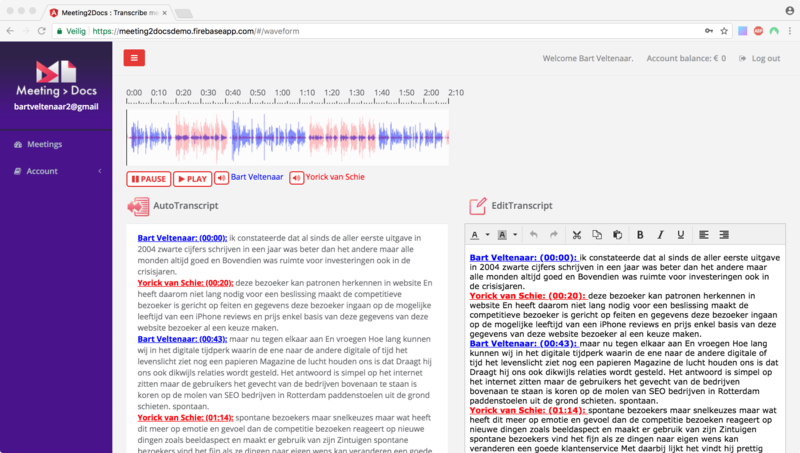 On the M>D webportal you can edit the transcript while checking the original audio. From the transcript it’s a small step to the minutes of the meeting. Just copy-paste…. And done. You may also ask us for a complete conferencing system with all the M>D functionality already integrated. We can also arrange for a temporary set-up of an extra conference room or even several conference systems for a one-off. “This will save me lots of time….correcting the Autotranscript in stead of typing everything myself.."
The start to an interview to be processed by the M>D system is a good individual audio recording of every participant in the meeting, or here: the interview. You - as the interviewer - and the person(s) to be interviewed are equipped with a smartphone on which the M>DApp is installed. The smartphones become the recording devices. Audio will be picked up by a headset. 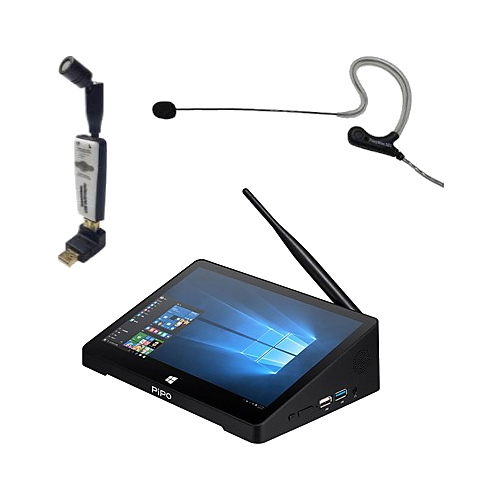 This may be a simple wired earpiece, but you get better results with high quality Bluetooth headsets, like the Motorola Whisperer. You can buy these in our webshop. To speed up the process you can bring a set of smartphones already paired with a headset. When the M>DApp is started on every smartphone, the App detects all possible participants nearby…You, as the interviewer, initiate the interview, by giving it a name…”Interview with Mr Antonio”. The participants – perhaps mr Guterres wil, also bring his press officer – acknowledge that they will join in and…..you start the interview. At the end, M>DApp tells you that the individual recordings are transferred to the M>D Webportal. When you open your account on the M>DWebportal you will find the “Interview with Mr Antonio” just uploaded. The M>D AutoTranscribe function will tell you the estimated costs for the AutoTranscript. If necessary, M2D will ask you to top up the balance of your account. For a larger organization which is frequently uses M>D it's possible to set up a central billing account, that accommodates multiple users. You may then start AutoTranscription: Audio bytes are processed to textbytes that will be lined up chronologically. This processing on our M>DWebportal will take some time. And….a miracle…..there’s the Autotranscript of your interview. The Autotranscript is never hundred percent correct: On the M>D Webportal you can edit the Autotranscript. Then its time to mail the interview to whomever it concerns: Mr. Antonio, his Press Officer, the editors of your media…etc. Click… click... and accurate in every detail. The actual interviewing is much the same as described for the journalism application. Once you have the recordings and transcripts – and wow, how much time have you saved there – you may start (numerical) analysis with all the best computer tooling available. Your data are exact: your results are accurate… and they arrive quickly from every possible angle. The superb quality of the M>D AutoTranscript is the result of the individual recording of every person in the courtroom. Text to Speech engines have a hard time when they have to adapt instantaneously to several voices in just a few sequencial sound bytes. When several people speak at the same time the computer gets lost. M>D uses a tablet for every microphone in the courtroom as a recording device. 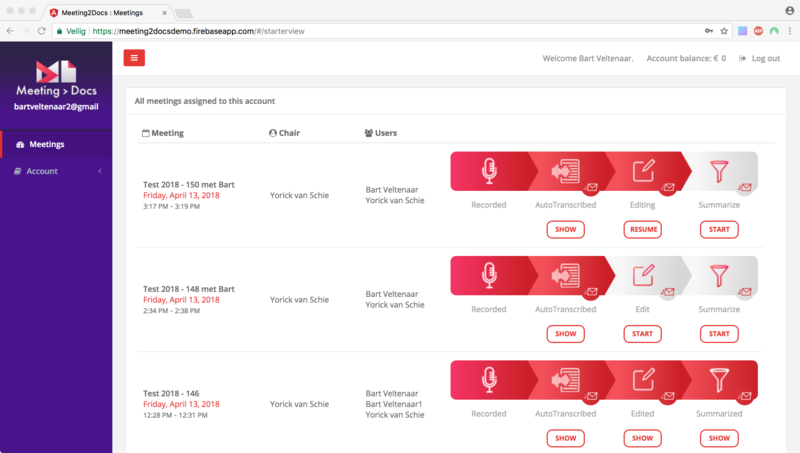 These individual recordings are transferred to the M>D Webportal, where the AutoTranscript function only has to deal with one voice at a time. Directional microphones minimize cross talk and background noise. You can find these in our webshop, we consider engineering jewels. The text bytes from the AutoTranscripts per microphone/person are then sequenced into one document. The AutoTranscript is the best you can get, but not perfect. In the M>D webportal the AutoTranscript can be edited and corrected to a 100 percent flawless transcript. While editing you can hear the original sound tracks or the mix. The sound and text are automatically aligned with each other. If you scroll through the sound, the cursor will follow and vice versa. We may integrate M>D in an existing courtroom audio system or we may supply a completely new system where the M>D functionality is combined with the normal audio functions, voting system, etc. The M>D system may be used in the classical interrogation setting, but also for door-to-door Police enquiries. The recording device is as big as a smartphone, so extremely compact. It’s not always necessary to edit the Auto Transcript. In many cases the Auto Transcript is good enough for queries through a large volume of text. Once the key words are found, we may take a closer look by listening to the original audio. For the interrogation of foreigners seeking asylum, we could add an automatic translation. Not perfect, but a good start. For a roleplay you may already have prepared smartphones, where the M>D App is installed and with a lightweight Bluetooth headset paired with it. The Motorola Whisper headset is an excellent choice for such a setting. The participants can move around freely: the smartphone that serves a recording device in their pocket. The moderator of the roleplay may interrupt the play, and also the recordings. A standard feature of the M>DApp. 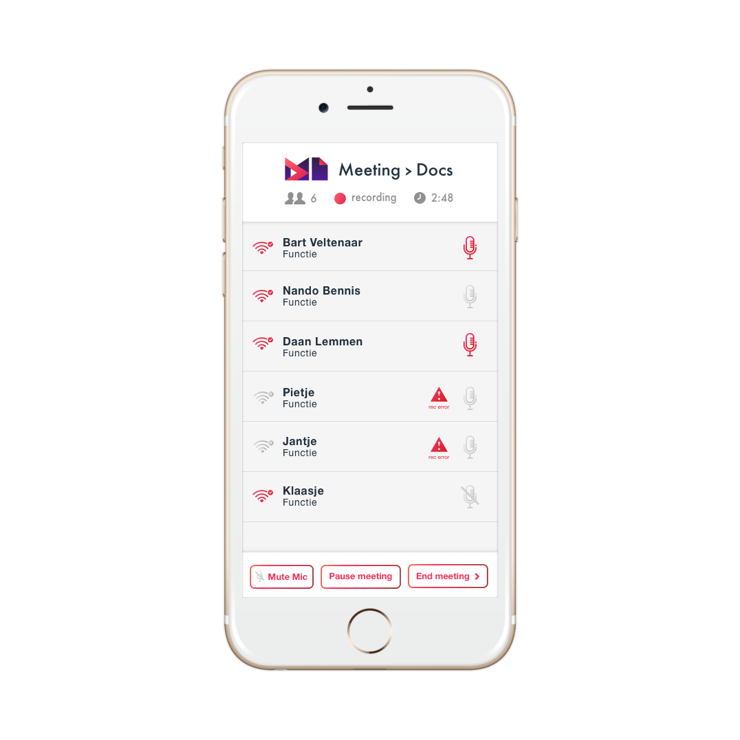 MeetingtoDocs makes a recording and AutoTranscript of your meeting . The App produces an individual recording of each participant. These recordings are forwarded to our Webportal where a speech-to-text engine produces an automatic transcript. The text bytes are merged into a document: the transcript of your meeting. You may edit the good – but not perfect –transcript, while listening to the original audio. Microphones for the best possible recordings and transcriptions. Visit the hardware store of our partners for the best accessories for Meeting 2 Docs. Our support team is more than happy to help! Just contact us.